You may remember that a few posts ago I wrote about deciding to go ahead and do some short term specialised trauma-focused counselling, parallel to the psychoanalytic therapy I am already doing with A.
I set out on this journey four weeks ago and it’s been quite a ride thus far, but before I begin writing about said journey, let me introduce you to a new character: Z., my counsellor. I have to admit that when I met her the first time I wasn’t entirely sure about her. My impression was mostly positive, and I absolutely felt that she was someone I could work with, but there was also a little bit of fear that she might not be quite strong enough to resist my habit of luring therapists and counsellors alike down side paths and blind alleys. What I mean by that is that, in the past, back when therapy was something I was doing because someone else wanted me to do it [parents, doctors, psychiatrists], I was very very good at finding ways of showing up for session each week, skilfully avoiding doing any actual therapy. What I did was to go in and talk about something entirely unrelated [I spent an entire year talking about ice-hockey and the LA Lakers with my first therapist], then dazzling them by intellectually linking whatever I had decided to talk about with psychotherapeutic theory. I realise, of course, that this was something I did because I simply wasn’t ready to engage in therapy, so in one way this behaviour is hardly surprising. But, at the same time, there was always a part of me that was deeply disappointed that none of my first three therapists ever pulled me up on my fairly obvious attempts at outsmarting them, and that they were instead, session after session, drawn into complex discussions about attachment theory, projective identification etc etc. I think what I was really craving was a therapist who would step into that pseudo-parental role, different to my own parents, steering a clear path in showing me that they were more interested in me than in my ability to spin intricate and dazzling webs. It wasn’t until many many years later in my very first session with D. that a counsellor finally told me that ‘Although your knowledge is very impressive, it’s not why we’re here.’ Felt like hitting a brick wall at a hundred miles an hour and then being told that it’s pretty silly to go running at a wall, when there was a perfectly good opportunity here to learn to use the ladder that was leaning against said wall. I’m not saying that D. was necessarily the first counsellor or therapist to see through this game I was playing, or to understand the reasons for why I was playing it, but she was the first person to properly make me feel that she understood that I was absolutely terrified and that rather than allowing me to carry on defending against this fear by using intellectualisation she cared enough about me to want to help me step onto the ladder and do something different. There was no pressure to make it to the top of the wall in the time we had, but instead there was a lot of focus on acknowledging the achievement of making it onto the first step. Any subsequent steps would be a bonus. So, knowing that I was about to begin a completely new type of counselling with Z., one which focused solely on the sexual abuse I suffered, one where talking about my parents, or being adopted, or the million other things that are part of my life and who I am, would play very little part, I was completely and utterly petrified. Thus, meeting Z. for the first time was a big deal. Naturally, meeting a counsellor or therapist always is, but I was very aware of the need to find a counsellor who wouldn’t gobble up deliciously smoked red herrings thrown their way, and so there was a lot on the line in that first meeting. Coming out of that meeting, my general impression of Z. was – as I said earlier – mainly positive, there was still a part of me that felt concerned that her statement that she ‘wouldn’t push me to go somewhere I didn’t want to go’, might potentially indicate that she was someone who, if I wanted to, I could easily string along in an attempt to not only avoid having to go to painful places, but to avoid challenging myself to move forward at all. Like I said to my sisters after the first session: ‘Z. is someone I would have had for lunch 10 years ago’. But the four and a half years of doing therapy with A., along with the counselling I did with D. prior to that, has made me realise how much there is to gain from doing my utmost to stop myself from going down that route. To, in a sense, stay on that ladder and keep climbing it. So, I knew that even if I was somewhat unsure of Z., I knew that I was different, as were my reasons for going into this counselling. Of course, as much as I try to consciously stop myself from hopping off the ladder, there may still be a fair amount of unconscious [or subconscious, if you’re so inclined] motivation for leading myself astray, hence, needing to feel sure that Z. would be able to spot this when I can’t. In my second meeting with Z., many of my initial fears were laid to rest. She came to the second session with a very clear view of what she would like us to work on and helped guide me through it. This is very new to me; I’m used to doing psychoanalytic therapy, where I’m pretty much always in the driver’s seat, and it’s a real challenge to now, suddenly, let someone else co-pilot. There were some things Z. had wanted to do in the second session, which she soon realised weren’t quite right for me, as they were things I had already worked out and implemented for myself, and she swiftly adapted to this, changing course to suit my trajectory. This lead to something I would never in a million years have thought possible: already in session three I took a plunge and showed her a drawing of one of the abuse situations and talked about it. It was scary as anything, but was much helped by discussing – prior to me handing the drawing over to Z. – what I wanted her to do with it so as to not have a repeat of that session with A. where I interpreted her immediate return of a drawing as a sign that she couldn’t quite bear looking at the reality of the abuse. Instead, this time, we made the agreement that Z. would hold on to my drawing until I indicated that I would like to have it back. Z. also showed some initiative when she felt I was getting into my normal way of racing ahead through a story, as though I’m talking about someone else, with complete emotional disconnect, by stopping me for a while and asking me to reconnect and to tell her what talking about this made me feel. This is very new to me. Naturally, A. is also very interested in what I’m feeling, and often tags a ‘Can you say more?’ [one of my absolute favourite questions] or ‘Can you unpack that?’ onto something I have said, in order to coax more out of me. But, I’m not used to being actually stopped in order to reconnect several times during a session. I had brought my beloved Doth with me to session. 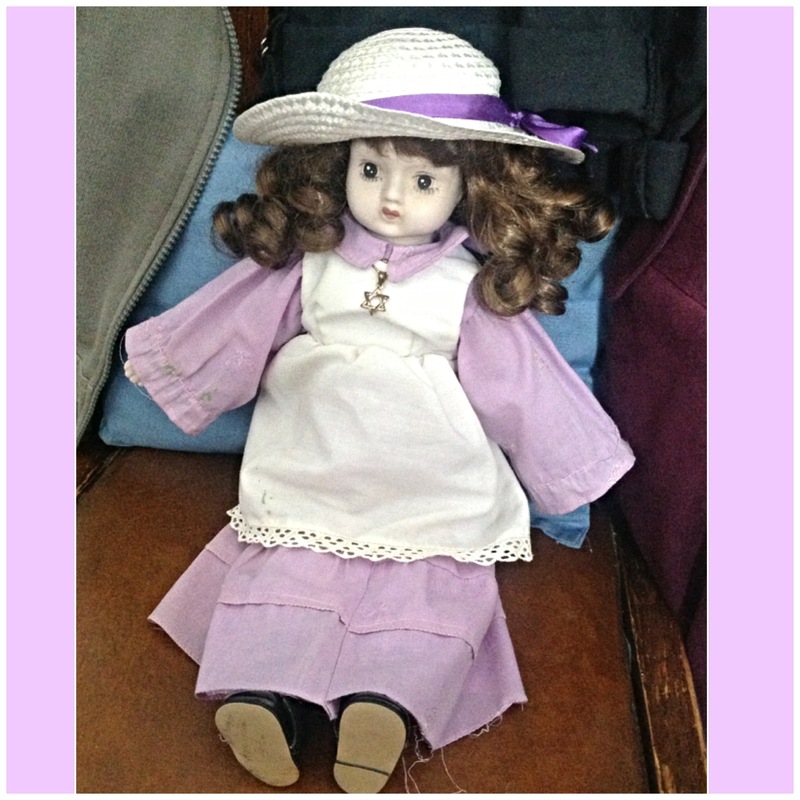 Doth, for those of you who haven’t had the pleasure of meeting her, is a porcelain doll I’ve had since I was a child. She was made by my best friend’s mother and she was the only person who knew about the abuse while it was going on; I used to sit with Doth, whisper in her ear the things my brother and M. made me do. So, needless to say, she is very very precious to me, and as childish as it may seem, I thought having Doth with me in session might make it easier for me to talk about the abuse, because, in a way, she has already heard it all. I felt regressing to that childhood ritual of talking to Doth about the awful things that were happening might help me overcome my fear of talking about the abuse for fear of breaking the listener. I think this parallel work with A. and Z. has the potential to be a very good thing. I had worried that I might be spreading myself too thin, or that it would become too confusing working with two people at the same time, but for now it seems to work quite well. Also, the work I am doing with Z. is very short term, only sixteen sessions in all, and is by its very nature a lot more intense than the therapy I’m doing with A., and I am hoping to use my sessions with A. to ensure that I remain safe while I’m doing this very painful work. I have already noticed that I am again having more flashbacks than the norm, but this is something I had expected. As I told a friend of mine: ‘Doing this was always going to be a totally rubbish time’, but I am hopeful that it will ultimately help reduce the amount of flashbacks I have, and also, that it will help me go further with A.
Sixteen sessions, even if structured, is not a lot of time, especially given that I suffered abuse from more than one person, and that the abuse went on for as long as it did, so I am hoping that doing this with Z. will open the door to carrying on talking about the abuse with A. once counselling comes to an end, much in the same way that the counselling with D. set me up for actively trying to avoid throwing red herrings at A., and subsequently, Z. In other words: onwards and upwards, one rung at the time. I’m glad you found someone that you can trust and talk to about this very painful subject. I’ll be keeping you in my thoughts and prayers. You be kind to yourself too. Hugs. Very very brave! Must be such a scary thing to do. I’m always amazed at how you always seem to meet things head on. Thanks for the comment. I’m not sure I always do meet things head on, although these days I try to not actively dodge them. Thanks for the comment. I’ve been a lazy blogger. Or, rather, life has got a bit in the way. The counselling was put on hold for two weeks as Z. was away and only resumed this Monday, but as tough as it is, I am hopeful that it will prove helpful in the end.